My husband and I just completed a 7-day Western Caribbean cruise we enjoyed over the holidays. (In fact, I’m sitting in the New Orleans International Airport as I write this, waiting for our flight home.) We booked the trip not as a birding trip, but as a scuba diving trip. You just can’t get off the ship early enough to get in any decent birding–completely out of our control. And with one day in each port we opted to spend our days diving rather than birding. Our ports of call were Costa Maya, Mexico; Roatan, Honduras; Belize City, Belize; and Cozumel, Mexico. We’d already done a Yucatan Peninsula birding trip (See: Celestun and the “bottomless passion of mosquitos,” and Birding on our honeymoon) and we spent a couple of weeks in Belize just two years ago, so we weren’t totally conflicted about scuba diving over birding. (Typically we do both–it’s wonderful that great birding places are also great diving spots but as I just wrote above, it just doesn’t work when the trip is a cruise. But I did hold out hopes that I would see a couple of pelagic birds on the trip. Well, that kind of didn’t happen. However, I did end up recognizing the frigate birds–I first saw those on our honeymoon in the Yucatan. And of course the usual suspects where gulls are concerned. But then one morning I saw some white birds along the water near the cruise ship. 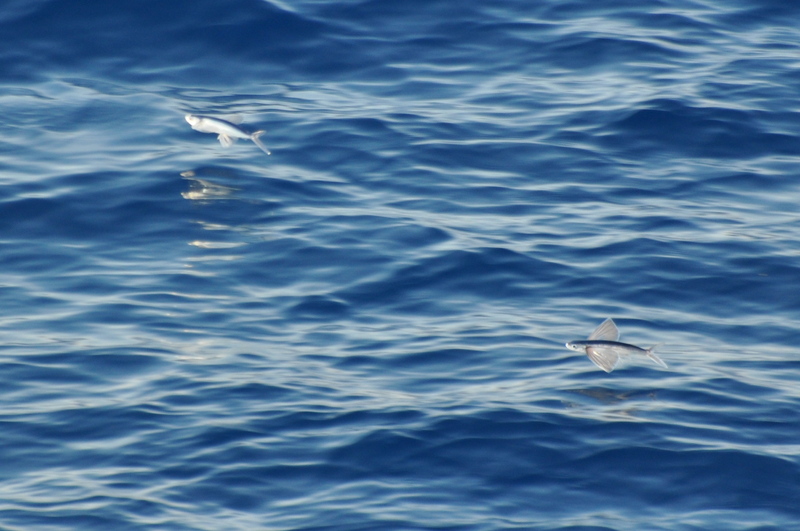 Turns out they weren’t birds at all but flying fish. 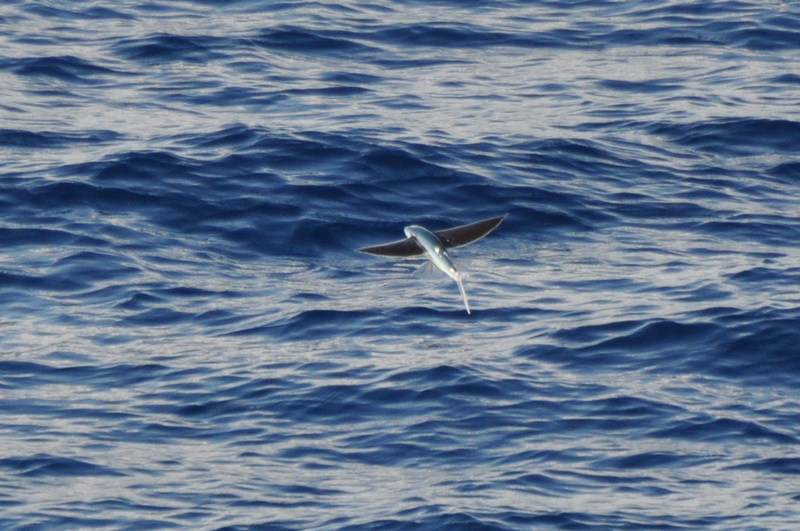 And hey, it has wings so I’m going to call it a pelagic lifer for me because I’d never seen one before. So no birds to report from this trip (since most of our time was spent under water). Instead, I found flying fish. Flying fish with wings!? Now that isn’t something I’ve seen before! Impressive. Nature never ceases to amaze me!